Dancebums and 6 Families had moms on their minds Saturday night when they premiered “Wow” at Bryant-Lake Bowl. The two groups of movers and musicians, who represent a new generation of local concert dance and music artists, used original compositions as well as tunes from St. Vincent, the Beatles, Yoko Ono and Tobias Jesso Jr. to express gratitude for all the nurturers in their lives. 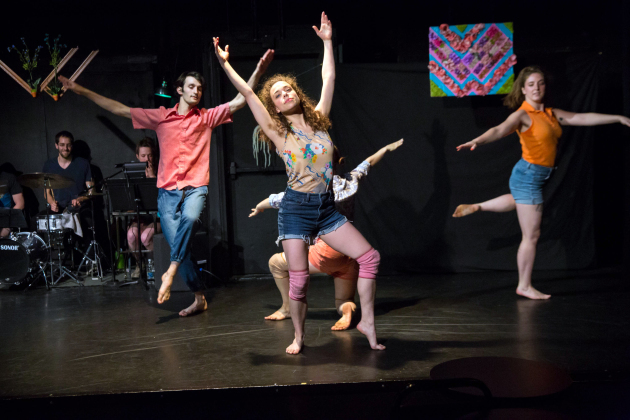 Dancebums -- Eben Kowler, Kara Motta, Margaret Johnson, Maggie Zepp and Karen McMenamy -- met while dance students at the University of Minnesota and they’ve been collaborating since 2011. The members are also familiar faces from other companies working around town. 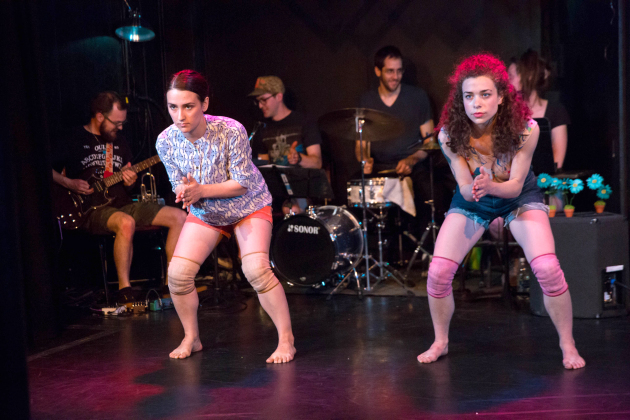 The group blends contemporary dance with a club show vibe. This is a tricky balance to achieve and the dancers are still working out their approach (which sometimes comes off as overly-earnest), while building upon the basics of modern dance technique and then breaking the rules. They do share a sense of adventure that they can continue to cultivate. The connection to motherhood in “Wow” seemed built more on the interpretation of the musical selections than any overt storytelling told through the movement. Perhaps the choices were propelled more than inspiration from particular people than a specific mood, although the evening did hint at a range of emotions. Mother’s Day as a setting for performance provides interesting material – for some it’s a day of celebration and for others, at best, it is filled with mixed feelings. There’s some deeper digging to do on the subject if Dancebums wants to explore further. For more information about Dancebums visit www.Dancebums.com.